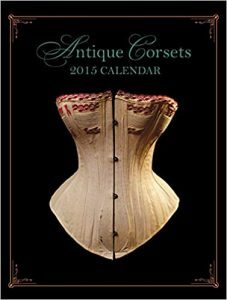 A Provocative Look at Intimate Apparel displays large, full color images of antique corsets and lingerie from the Victorian era through to the 1960’s; including detailed descriptions of the corsets and lingerie, with dates, sizes and historical references. Titillating French translations compliment the provocative vintage and modern images of ladies in lingerie. Many examples of original French lingerie are displayed, some of the most beautifully designed in the world. A pictorial history of the corset. Enjoy a monthly view of corset history from 1800-1950. Each page is printed on full color glossy card stock with no text on images – perfect for framing once the year is up. Amazon Review: I received my copy as a gift and look forward to getting it every year. Very beautifully done with wonderful, full color photos and detail shots. Some truly lovely antique corsets! I look forward to visiting the corset museum one day!